BirdCagePortal.com - Pet Bird Supplies, Parrot Supplies, Cages & Bird Products - The "Kitchen Sink" - No More Avian Perch Potatoes! The "Kitchen Sink" - No More Avian Perch Potatoes! Birds in the wild often fly for miles and with their daily food foraging activities have a very active life. You won’t find sedentary birds in the wild! However, that cannot be said for our companion birds that often don’t get a healthy amount of exercise. Birds can suffer the same consequences that we do from unhealthy lifestyles, such as: obesity, heart disease that can lead to a sudden attack or stroke, fatty liver disease, kidney disease and arthritis to name a few. Exercise along with a good diet is critical for a bird’s good health … just as it is for ours. We are fortunate today to have many products that help us encourage a bird to be active. But before I discuss two of those alternatives (The “Kitchen Sink” and Conversion PlayGym) it might be helpful to mention a non-product way I help my birds get some needed exercise. How about some “birdie aerobics?”. Birdie aerobics a good way for your bird to get some flight exercise … that is, active wing flapping when their clipped wings prevent natural flight. Perhaps the best way I can explain what I mean is to describe a daily activity that provides a lot of fun for Fagan, my Moluccan Cockatoo. He loves his aerobic workout so much that he is sure to remind me if I’m late for our daily game. This aerobic activity can be performed while he is on a hand-held perch (with a diameter he can grasp securely) or sitting on my towel-wrapped arm. The towel provides an extra secure way for him to hold-on tight. It also protects me in the event he gets overly-excited which could happen with any bird … especially with a mature, male Moluccan Cockatoo! Instead of using a towel, you may prefer gripping your birds feet in a secure way to help him maintain his balance and prevent falling. Whichever way you prefer will have a lot to do with the personality and play habits of your bird. The aerobic activity itself is very simple. I just raise Fagan and then lower him quickly… that is, just enough that he must spread his wings and flap to maintain his balance. I keep this raising and lowering process going until I either get tired, or I see he is ready for a short rest. Then we repeat the flap/rest routine until it is obvious he has had enough. This activity has taught him the joy of wing flapping and now when he is in his cage I’ll see him occasionally holding onto the bars of his cage entertaining himself with his own wing-flapping routine. Our future aerobic activities will include an introducution to outside flight training with an Aviator harness. More on how that works out later … his flight feathers need to finish growing in first! I change the wing flapping aerobics routine for my African Grey, Alice Marie. Alice is rather reserved and would not enjoy the raise/lower wing flapping activity that Fagan likes. However, Alice loves to “fly” on my hand. So she sits on my hand while I securely hold her feet in place, and then run around the room. The movement encourages enthusiastic wing flapping on her part as she flaps her wings and “flies” on my hand without actually being airborne. This is a rountine she eagerly looks forward to several times a week. If “birdie aerobics” might be something you want to try with your bird do so only if your bird is secure enough to accept this type of handling and introduce the activity gradually so not to overwhelm or frighten your bird. Kitchen Sinks and Conversion Gyms are activity centers that offer a different exercise opportunity … one that is filled play-type fun. Fortunately, today there are many wonderful products, limited only by the imagination of many creative manufacturers. “Kitchen Sink” PlayGyms and “Kitchen Sink” Conversion PlayGyms are bird favorites. Both these products are aptly named because they include so many spinning parts that they do seem to have everything, including the kitchen sink as the saying goes. The Kitchen Sink PlayGyms are designed to hang from the ceiling and because of that a bird is required to exert extra energy to play on the movable gym. There are Extender Ceiling Guards available that work with these hanging gyms to prevent birds from climbing too high or reaching the ceiling. The Kitchen Sink Conversion Gym is terrific because it is really two gyms in one. The top part of the PlayGym is a “Kitchen Sink” which can be removed and hung. If that is done, then the bottom part of this ingenious design can be converted into a play stand with the simple addition of an additional perch that is included. You’ll be amazed at all the rotating parts on these playgyms and the fun bird toys that are included. Kitchen Sinks are very high quality and are made of construction grade PVC. The perches provide secure and comfortable footing for your bird because the special texturing process used insures the same confident footing that natural wood provides. The texturing process has an additional advantage because it does not create grooves that can harbor bacteria and is easy to clean. 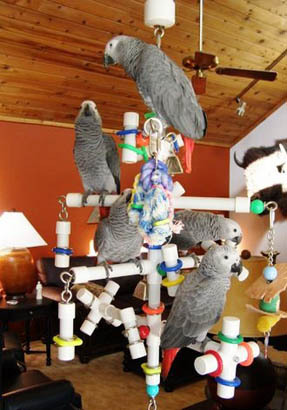 These products are availabe for smalll, medium and large birds offering a unique addition to a bird’s playtime acitivites. 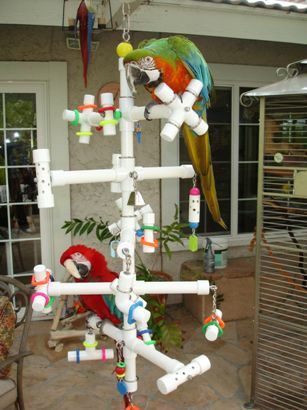 Kitchen Sink products and Forever Toys, created by the same manufacturer, as well as many other great products for your birds can be found at BirdCagePortal.com.